Deadline for all applications — Saturday, May 26. First ever Family Pride event in Mt. Airy that celebrates the diverse, beautiful, and extraordinary LGBTQ families and artists here in Philadelphia. In celebration of Philadelphia’s 30th Anniversary of Pride, the Mayor’s Office of LGBT Affairs, Philadelphia Family Pride, and the Mt. 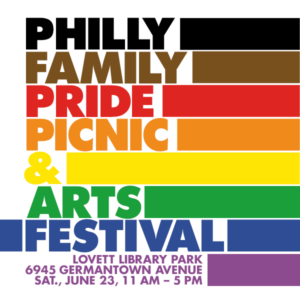 Airy Art Garage are partnering on the Philly Family Pride Picnic & Arts Festival. The event will be held at Lovett Library Park (6945 Germantown Avenue) on Sat. June 23 with a rain date of Sat., June 30, 2018. The event runs from 11 am–5 pm. Admission will be free and open to all ages, families, and community members. This event will have family-specific entertainment, fine art and handcraft, music, food, and resource tables from a variety of organizations and nonprofits that provide services and support to LGBTQ parents and youth. Download the Open Call for Artists here. All artists, both emerging and professional, are invited to apply. Looking for more details on the Art Festival? FAQ: Find answers to important questions here. Looking to submit your table fee online? $100 for nonmembers (plus $3 service charge per transaction).